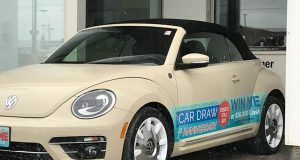 During question period Wednesday, NDP MPP Sol Mamakwa (Kiiwetinoong) said the Ford Conservatives must stop undermining the government’s duty to consult with First Nations on the Far North Act, and called for government engagement by holding hearings in Far North communities in order to improve and replace that act. 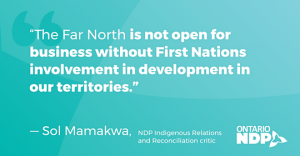 “Proper engagement on the Far North Act should not be rushed and involves having hearings in the Far North,” said Mamakwa, NDP Indigenous Relations and Reconciliation critic. “If hearings are rushed and communities are forced to travel to give evidence that means many community voices will be missed. Mamakwa said First Nations in the Far North want to benefit from the resources in their territories, but many First Nations are concerned the Ford government is undermining the duty to consult when they refer to cutting red tape. “First Nations are not red tape,” said Mamakwa. “Supporting the UN Declaration on the Rights of Indigenous Peoples gives the government the path to resource development they need. 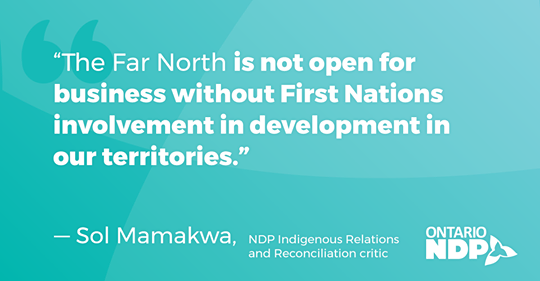 “The Far North is not open for business without First Nations involvement in development in our territories.